the chemical process by which green plants use light energy to produce food. What is the least important color of light in photosynthesis? The process by which green plants use sunlight energy to convert water & carbon dioxide into oxygen & glucose is the basis for virtually all life. Sugars, the first products of photosynthesis, are converted into starch, protein, cellulose, and thousands of other chemical compounds. Check out this link for information on the light Photosynthesis uses. Photosynthesis is also the source of the oxygen which we breathe. Before plants appeared, the earth's atmosphere was high in carbon dioxide but contained no oxygen. The present atmosphere, by comparison, is about 0.035% carbon dioxide and 21% oxygen - thanks to photosynthesis. 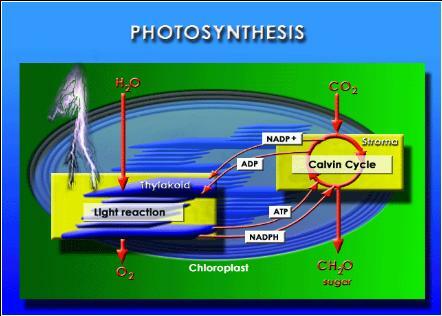 For more details about the process of photosynthesis go here. Click on this leaf to take a journey through the light reaction. Don’t forget the Calvin cycle. Cellular respiration: food molecules are broken down to release the energy in their chemical bonds. Even though glucose is a source of energy for living things, Adenosine triphosphate, ATP, is the energy molecule used by most organisms. Energy is released when ATP is changed to ADP. This energy is available for cells to carry on their life processes. Chemically, cellular respiration is the exact opposite of photosynthesis. While photosynthesis occurs only in some cells, respiration occurs in all cells. 2. Slides 1-2 - An introduction slide showing what you will be presenting and how it is related to photosynthesis. 3. Slides 1-2 - The Chemical formula for Photosynthesis (label-reactants & products). 4. Slides 1-3 - How is photosynthesis related/connected to cellular respiration and the energy animals and plants use? (Is there a connection here, compare the two chemical equations)? · How does a plant store the energy (organic compounds)? · Do plants perform cellular respiration? * Use this rubric to evaluate this presentation on photosynthesis. 2. Slides 1-2 An introduction slide showing what you will be presenting and how it is related to photosynthesis. · which is biggest producer of photosynthetic byproducts. Why? · identify the photosynthetic processes taking place in each part , dark reaction take place in the ______. · What are the products of the light reaction? · How are these molecules involved: (ATP, ADP, NADP+, NADPH) sugars, carbon, electrons. · What are the products of the dark reaction? · Where are these items found? · How are the light and dark reactions linked together? 4. Slides 1-3 Photosynthetic efficiency: How efficient is photosynthesis? · Is it more efficient then a car engine? Set your power point to run on its own once started, allowing you to discuss and explain your presentation without long pauses or going to fast. Give yourself enough time to explain each slide. *Warning* practice makes perfect. Setting the timing and slide transitions may run different on computers with different power point versions such as power point 2000 and power point 2003. Important: Use scoring rubric to self evaluate power point. Presentation saved to disk and server file for access in the classroom (always have a backup). Bring a hard copy of presentation: handout view (6 slides to a page format) and self evaluated scoring rubric stapled together with the rubric on top. Create a story board/Cartoon describing the process of photosynthesis. Click on this link and have fun creating you story. Use this rubric to evaluate your story board . Read the entire assignment before you begin. All items for this assignment should be on the same document. 1. View this short clip about photosynthesis and complete these questions. Use this bio coach link to brush up on your photosynthesis knowledge (you will need shockwave for this link). Read the introduction and concepts 1, 2, 3, 4, 5, 6, 7, 8, performing all task and the items below (2-5). Complete leaf diagram in concept 4 and paste into this assignment with your video questions from above. Complete Mesophyll cell diagram in concept 5 and paste into this assignment. 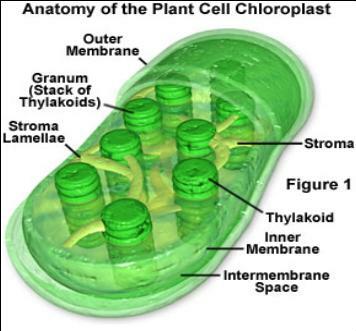 Complete chloroplast diagram in concept 5 and paste into this assignment. Complete the self quiz (questions 1-19). Provide evidence that you scored 100% by pasting final score in this assignment and typing out the numbers, letter and written answer for the self quiz on your assignment. *** If you can't paste try this: while on the screen you want to copy from, press the print screen (prt scn) key on key board (top right side) and then open word or paint and paste. This will create photo copy of what you have completed. From paint you can cut out just the diagram using the box tool and copy and paste into your assignment. Complete all of the above while going more in-depth by completing the lets take a "closer look" at the light reaction. Click on "a closer look" on concept 8 and read about the light reaction. Complete the self quiz (questions 1-25). Provide evidence that you scored 100% by pasting final score in this assignment and typing out the numbers letter and written answers for the self quiz on your assignment. Staple together with this assignment on top if necessary. 1. Now it is time to get some eTutor help on photosynthesis from our Honors text book. Open this document and follow the directions. Green is the least important color of light in photosynthesis. The pigment chlorophyll abosrbs all colors of light except green. Plants look green because that color of light is reflected, not absorbed and used. Red and blue light seem to provide the most energy for photosynthesis since they are the most completely absorbed.